This linear park protects a large portion of the upper Cariboo River and surrounding wetlands, from Kimball Lake downstream to where the river enters Cariboo Lake. 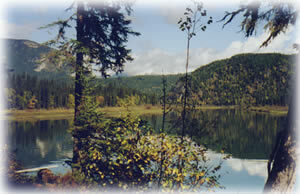 It is critical habitat for wildlife, especially moose and waterfowl. The waterfalls, old-growth and estuaries at this park can be accessed via canoe or power boat. The park provides opportunities for water-based recreation: canoeing, rafting and power boating. This park is a wilderness area that is not regularly serviced or patrolled. Swimming is not recommended, due to high volume water flow with dangerous currents. Watch for river hazards, such as sweepers (trees hanging into the water), deadheads (submerged trees), sand and gravel bars, and high water during spring run-off or heavy rains. Vehicle access is on logging roads from Likely or Barkerville in snow free months only. The park is located approximately 90 km from the town of Likely on the 8400 Road or 70 km from the town of Barkerville on the 3100 Road. Please drive with caution on these active logging roads. Use your headlights at all times. The closest communities, towns and cities are Wells, Likely, Barkerville, Quesnel and Williams Lake. Plate 1 [PDF] - The dramatic landscape around Mitchell Lake in Cariboo Mountains Park. Plate 2 [PDF] - Avalanche tracks at the headwaters of the Mitchell River in Cariboo Mountains Park. Plate 3 [PDF] - Looking south down Niagara Creek in Cariboo Mountains Park. Plate 4 [PDF] - Looking east into the Betty Wendle addition to Bowron Lake Park. Plate 5 [PDF] - Looking northeast in the Cariboo River addition to Bowron Lake Park. Plate 6 [PDF] - Looking northeast in the Wolverine addition to Bowron Lake Park. Plate 8 [PDF] - Looking south down Cariboo River Park. Plate 9 [PDF]- Typical backcountry in Cariboo Mountains Park. Plate 10 [PDF] - Canoeist preparing to enter Kibbee Lake. Photo courtesy of Peter Tasker. Plate 13 [PDF] - The Mitchell River wetlands. Plate 14 [PDF] - Looking west down Ghost Lake in the Natural Environment Zone. Plate 15 [PDF] - The Bowron Lake campground in 1973. Photo courtesy of Peter Tasker. Plate 16 [PDF] - Looking east down Mitchell Lake. Mitchell River in foreground. Plate 17 [PDF] - Looking west over Summit and Stranger Lakes at Quesnel Lake in background. Plate 18 [PDF] - Cow moose feeding in the Bowron wetlands. Plate 19 [PDF] - The Bowron Lake wetlands. Plate 20 [PDF] - Looking northeast across Isaac Lake up the Wolverine Creek. Anonymous. Plate 21 [PDF] - Twin Lakes in the alpine of Cariboo Mountains Park and Wells Gray Park. Plate 22 [PDF] - One of the old trapper cabins located around the Bowron canoe circuit at McLeary Lake. Photo courtesy of Leif Grandell. Plate 23 [PDF] - Trails on the Bowron Circuit have been vastly improved from the knee high mud that existed in 1973. Photo courtesy of Peter Tasker. Plate 25 [PDF] - A side valley draining into the Matthew River Valley from Cariboo Mountains Park. Only paddlers experienced with moving water should attempt this section of the Cariboo River (which is mellow compared with some sections outside the park). Wear approved PFDs and watch for deadheads and sweepers. Fish for rainbow trout and bull trout. Anyone fishing or angling in British Columbia must have an appropriate licence. The park is open to hunting. Please check the Hunting & Trapping Regulations Synopsis for more information. Visitors can cross-country ski or snowshoe in the park but there are no set trails. The boat launch is gravel and may be flooded at high water. It is next to the bridge by the information shelter. The road access is narrow and confined. While campfires are permitted, it is preferable to use a camp stove, since this is a fragile environment. If you must have a fire, bring your own firewood or use only dead and down wood. Please use existing campfire rings, do not build new ones. Wilderness, backcountry or walk-in camping is allowed, but no facilities are provided. There is an information shelter at the Cariboo River crossing on the 3100 Road.